More ways to see My Brother’s Shoes! Only TWO Days until the big Castro Theatre showing on Sept. 12th at 3:00pm!!! And I have more news! Such news! Did you miss the opening on August 15? Are you NOT able to go to the screening on Sept 12th?? Well, you are in luck! Go to the Schedule Page and keep checking as we get more and more listings and screenings. The long wait if OVER!! We are making Blu-Ray copies of My Brother’s Shoes and are filling the orders that were pre-ordered. The lucky fans who ordered a copy will be getting them soon. You can still purchase yours on our site by clicking the button or CLICK HERE. 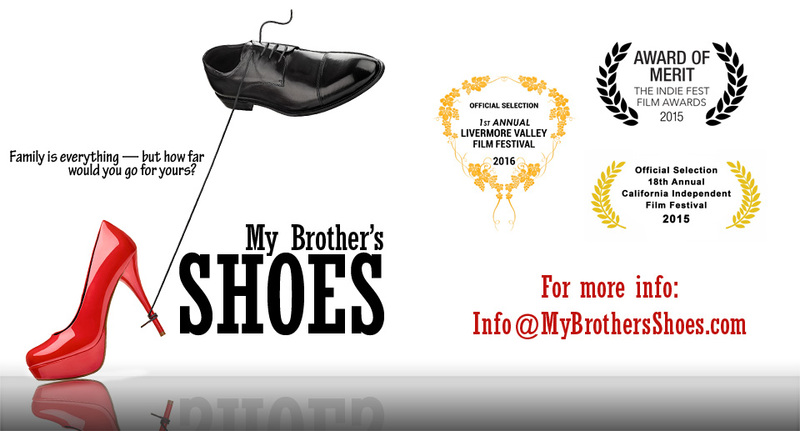 A review just came out on the CA Independent Film Festival line-up and strongly recommends four of the films on the schedule and My Brother’s Shoes is one of them! We are on their list of “favorite” films! Congratulations Blake for getting this praise. And congratulations to all of the cast for making this film into a delightfully entertaining “must see” film. Get your tickets now! We are only 4 days away! To see the complete review, click here.